EDITOR’S NOTE: Aldi also sells a 4-in-1 greenhouse, usually later in the spring than this version. You can read our more extensive thoughts on that model here. When spring rolls around, Aldi is all over the gardening. Whether it’s small tools or large equipment, the grocer dutifully stocks goods for your yard and garden during the spring and, to a lesser extent, during the fall. We’ve covered a number of Aldi’s gardening products. One in particular was the Gardenline 4-Tier Greenhouse, a springtime ALDI Find, which we generally like. 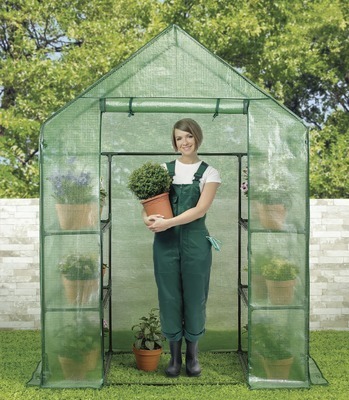 But Aldi also sometimes sells a larger version of this greenhouse, too. That would be the Gardenline Walk-In Greenhouse. The Aldi version of this greenhouse runs, at the time of this post, about $34.99, which is about $15 more than its smaller 4-tier cousin. The greenhouse is 4.5 feet wide, 2.3 feet deep, and 6 feet tall. Of note, Ohuhu also makes the aforementioned 4-tier greenhouse. Both have similar materials and similar profiles, including the same green tarp exterior wrapped about a steel frame. For example, both have the same green tarp exterior wrapped about a steel frame. Both also have the same 22-pound limit on each shelf. The biggest difference is size and price. Beyond that, though, the two seem to be broadly similar. We haven’t tested this walk-in greenhouse, but given the similarities to the 4-tier version, we think our observations of the smaller greenhouse also hold true for this larger one.